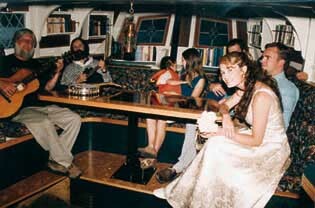 Blarney Pilgrim offers a unique venue for those special occasions. The spacious Great Cabin's dining table comfortably accommodates up to eight persons and is the ideal setting for an intimate Birthday, or Anniversary dinner. Blarney Pilgrim can co-ordinate with any of a number of fine caterers to make your special occasion truly memorable. We welcome your enquiries and will be happy to discuss the many options available. Tell us about your interests and requirements.